The Seagate® Backup Plus Slim Portable Drive is the simple, one-click way to protect and share your entire digital life. Perfect to take on the go, the sleek metal case design allows for the thinnest portable hard drive available. Compatible with Windows XP SP3, Vista, 7 and 8 and Mac OS X 10.6 or higher operating systems. 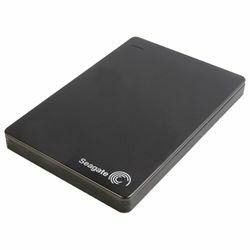 Features mobile backup using the Seagate Mobile Backup App. Includes 18-inch USB 3.0 cable.